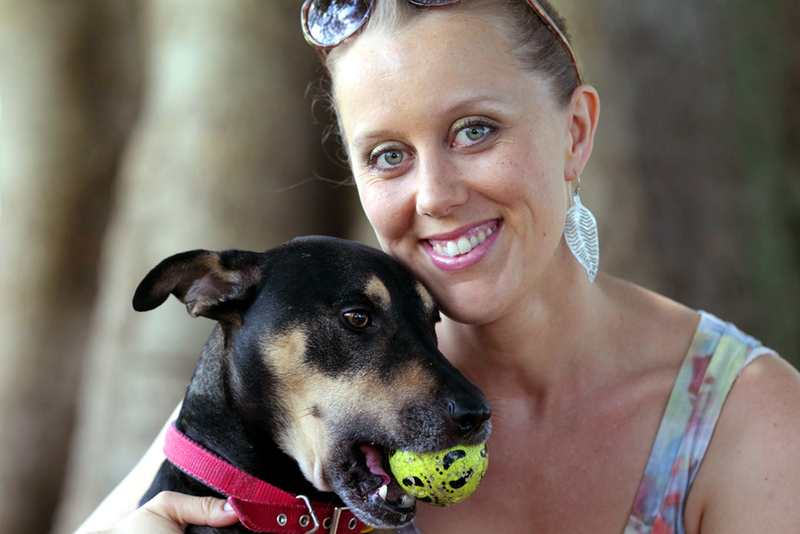 Comedian and Lost Dogs’ Home Ambassador Claire Hooper has been through a lot with her Staffy x Kelpie Dusty, a former resident of the Home. Dusty, along with Claire’s husband, makes up their family unit of three, and it’s probably fair to say that he has gotten to know Claire as well as she knows him. Dusty is a lot of things to his owner, not least a source of fun and occasional comedy, but also a faithful companion and comforting mate. For Claire, having a dog has been a fairly constant part of her life for as long as she can remember. Her early childhood photos often show her curled up with the family’s brindle bull terrier. And it is her early love of this kind of breed, she thinks, which led her to pick Dusty. Today, while Claire makes a living out of making people laugh, she is also aware that the enjoyment her dog brings her, and the way in which his antics make her laugh, are key to keeping her happy and balanced and able to go to work every day. “When I think of life before Dusty, it honestly was a little bit grey. The difference in my mood when we got him was almost immeasurable,” she says. “Some people aren’t in a position to have a dog because of their circumstances – and it can’t be a measure in their lives that everyone can take. But honestly, if you’re blue or low, I couldn’t recommend anything better. Caring for a dog I think, can in a way be a sort of transference of taking care of yourself. Claire also says it’s true that in moments of sadness, or having a little cry, there can be nothing nicer than a dog’s intuitive empathy. A paw on your knee or a big lick on the cheek can be the best sort of emotional balm. But more than this – it is in everyday life that Dusty administers regular doses of the best medicine there is: laughter. Dusty loves expending energy, and is kept occupied by big walks, runs in the park and agility exercises – at which he excels. It is also in the park, that Dusty taught Claire her first trick. After a big run off the lead, Dusty will always return to Claire and she slips his harness on. Claire says he genuinely seems to love the sensation of the earth and grass beneath him as he moves along the ground, and he’ll happily surf along for about 20 metres, before jumping up and continuing his walk. Dusty is also a great physical comedian. “He’s very wriggly, and very vocal. He does great loud yawns,” Claire said. “And when he gets excited, he just moves in such a funny way – it seems almost like his joints have disappeared. For Dusty and his loving ‘parents’, life together is a mutual triangle of love and hilarity. In a way that seems symbiotic, having a dog in their lives brings unadulterated happiness, and for Dusty, life in his second-chance home couldn’t be more fun, or more secure and safe. And Claire can go to work each day, knowing that spreading laughter around among her fellow human beings is just one way of passing on some of nature’s best medicine. When Claire is asked a slightly ambiguous question about Dusty and his comic personality, she doesn’t hesitate for long. The comedian is mulling the hypothetical: If Dusty were to tell a joke, what would the punch-line be? “Oh, I know this one,” says Claire. “Me and my husband have talked about this. I think it would be: ‘and then I licked it’”. Claire and her shelter pet really are, it seems, the perfect comic team.